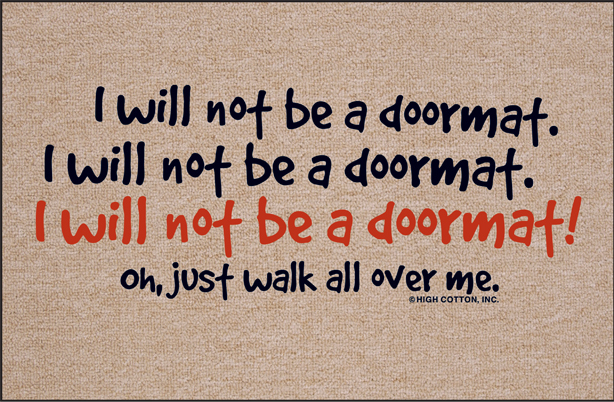 Bit of Blue Sky: I am NOT a doormat! 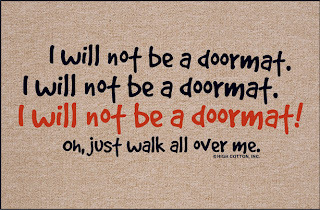 I am NOT a doormat! I had a pretty good day today, I almost spent our savings on a new Pampered Chef decked out kitchen. I was thisclose I swear (just kidding Hubs if you are reading this!). I am in desperate need of some replacements, most of my kitchen gear was given to us almost 6 years ago when we were married and they are wearing out. I wasn't very kitchen saavy so I didn't register for very high quality items. Like my cookie sheet will no longer come clean. I have melted several spoons and utensils. I have a few Pampered Chef items so far: pizza stone, apple wedger, spatulas, mixing spoons, silicone scrapers, silicone whisk, 1 cup prep bowl set, dinner plates and coffee cups, mix 'n chop, bamboo salad tongs and I love them. Today I added a mango wedger, hand chopper, cutting board scraper, measure-all cup, and adjustable measuring spoons to my collection. I have plans to purchase a cutting board in the near future, especially since I have friends throwing more Pampered Chef parties next month! I find myself cooking much more now that Hubs is home from deployment and I need the proper gear. I've added to my "When I Win the Lottery" list; I want a kitchen stocked with Pampered Chef gear! Hubs is doing better today, he tried to not take his pain pill though and he soon regretted it. Luckily for us it has been rainy and chilly this weekend so hanging out at home watching football has been great. Can I tell you how stoked I am Auburn lost to Clemson?! Geaux LSU!! I use to be the same way. Everyone would walk all over me. Basically, I was nonexistent until they needed something. I was too quiet (I know.. Me, quiet?!). At some point, you just get tired of it. Too many people take advantage of you and you stick your middle finger up and say "I'm done". Or at least, mentally, that's how I felt/ reacted. Ready For What Lies Ahead!